We loved Music with Philip so much so that we used to drive to Brookline to attend his Toddler and Preschool Music classes when my kids were younger. He is doing a show to benefit the Brookline Early Education Program this weekend on Sunday, 10:30 am at Temple Ohabei Shalom: 1187 Beacon Street, Brookline. This year’s line-up features Vanessa Trien, plus a mash-up of her band and mine, along with some BEEP alumni chiming in on a song or two. Vanessa and Philip will both be debuting new songs, so don’t miss it! 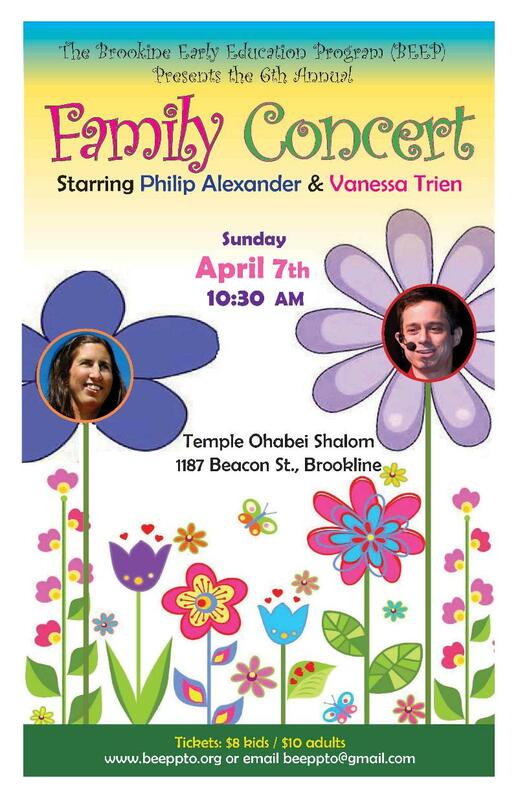 What: Family Concert to Benefit BEEP, featuring Philip Alexander and Vanessa Trien together for the first time! MONDAYS : April 8th to June 24th. No class on April 15th or Monday May 27th. WEDNESDAYS : April 3rd to June 10th. No class on April 17th.